As you’ve probably already gathered, this is a bit of a departure from my usual blog posts here on Ashleigh Online, but I’ve had lots of people asking me how I got into journalism lately and I know that lots of you guys are interested in potentially becoming a journalist, so I thought I’d share some tips with you on the off chance that you are looking for some. I’m a full-time journalist, and have been for four years now (update: now seven!). I write for several different websites at publisher IDG UK, including Macworld, Tech Advisor and Digital Arts. You can find my articles online here, here, here. I’m not pretending to know everything about journalism. Far from it, in fact! But I hope that this might inspire you and send you off in the right direction if you’re hoping to become a journalist in the future. If you’ve got any questions about anything at all related to journalism then feel free to ask them in the comments section at the bottom of the page. 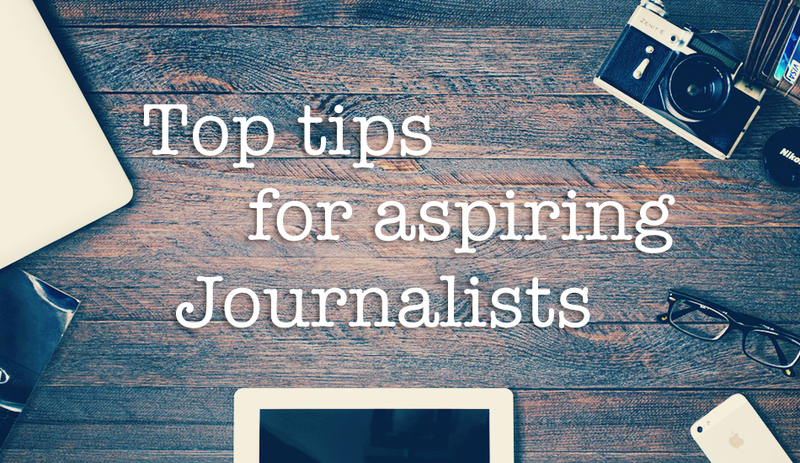 So, here are my top 8 tips for aspiring journalists. In most cases, a degree is a necessary requirement to become a journalist, but contrary to popular belief you don’t need to have a degree in journalism. If you want to get a degree in journalism or already have one, that doesn’t at all mean it was a waste, but if you’ve got a degree in another subject or are looking to go to university to study something else you might still be able to be a journalist at the end of it. For example, my degree was Media Arts at St Mary’s University (a uni and course I would wholeheartedly recommend, by the way). I did modules in everything from Photoshop and Illustrator to web design and animation. I also studied films, TV, radio, photography, and there was even a course on Disney. There was a module on Journalism and I studied creative writing as half of my degree in the first year, but they didn’t play a huge part in my degree at all and my employers were fine with that. Obviously they’ll want you to know how to write, but there are other skills involved in journalism and you’ll be surprised how many you can learn from other degrees and courses that’ll impress potential employers. That sort of leads me on to my second tip, which is to focus on learning more than just how to write. Obviously writing is the core part of journalism but if you know how to take photos and edit them in Photoshop, for example, you might just have the edge over other candidates vying for the same role as you. This definitely helped me land my role at IDG after just one week of work experience. Yes, that’s right, work experience is absolutely invaluable, and it’s without doubt how I got my job as a journo. You’ll never really know what it’s like to be a journalist until you’ve tried it, so I would highly recommend getting an internship at a website, magazine or newspaper, even if it’s just for a week or two. I hate that it usually means working for free, but I honestly learnt so, so much about journalism in my one week at IDG, and managed to impress the team enough to convince them to invite me back as a full-time employee once I’d finished university a few months later. While you’re on your work experience, make sure you’re unforgettable. Go to everything you’re invited to, whether it’s a lunch out of the office or an event in the evening. Getting to know people is essential and if they remember you when a job opening comes up you’re one step closer to becoming a journalist. I would highly recommend starting a blog if you haven’t already. It’s basically an online portfolio that’ll show off what your capable of. Blog about something you’re passionate about – it’s a really fun hobby anyway and a great way to practice writing, but it could well lead to your dream job too. We recently hired someone based on a few days of work experience and their fantastic, established blog. From his few days in the office we knew he would fit in well with the team, and we already knew how great his writing was after checking out his blog, so we snapped him up before anyone else could and he’s now a key member of the team. Blogging also gives you the opportunity to learn about things that are growing ever more important in journalism, including SEO (Search Engine Optimisation) and analytics. If you can prove that you know something about SEO in a journalist job interview they’ll be impressed, that’s for sure. Take a look at my articles on how to start a blog for more tips and inspiration. I wasn’t very good at Twitter when I started out as a journalist, but social is becoming equally as important as SEO in journalism, and that’s expected to grow. It’s a good idea to be familiar with Twitter and other social media channels such as Facebook, Pinterest, Instagram and LinkedIn, so once you’ve set up a blog be sure to start promoting it wherever is relevant. Having a blog with a big social following, or simply having a big social following yourself, is another thing that’ll impress potential employers. Make sure you stay positive on Twitter and other public social media platforms though, because if an employer takes a look at your Twitter feed and it’s filled up with negativity they’re not going to get a good vibe from you, and it could well prompt them to pick another candidate for the role. A healthy debate on Twitter is fine but a rant about your ex or a nasty word about a former employer is very off-putting. This is so important. Read as much as you possibly can from the websites you love and would like to work for. If you’ve got an interview lined up, get an idea of their writing style by reading everything they’ve written over the past week. Reading will go a long way to helping you figure out your own writing style and decide what works and what doesn’t. If you enjoy reading an article, think about why and try to apply that to your own writing next time. When you feel like you’re ready to start looking for a job or an internship, there are several places you should look. The go-to site for any journalist looking for a new job is Gorkana, and you’ll find internships and entry-level jobs there too. If you’re just starting out, look for Editorial Assistant roles to help you get your foot in the door. It’s generally the most junior editorial role so it’s the perfect way to start from the beginning and work your way up as you learn. You can also try Journalism.co.uk. My final tip is a really important one, and that is to never give up. It’s a popular career choice and that means you’ve got a lot of competition, but it’s so important to stay positive and believe that you can achieve your dreams. It’s not going to happen straight away – it’s likely to take a lot of time and effort, but just remember that it’ll be worth it. Employers can tell the difference between someone who is passionate and someone who is desperate, and they’re always looking for the former. Don’t stop writing, stay positive about your blog and keep at it (employers also notice if you haven’t updated your blog in a while), send emails to magazines and websites to find out whether they’ve got any opportunities for you whether it’s work experience or freelance work (but make sure you don’t pester them). And get out and about and meet people, because journalism tends to be a ‘who you know’ kind of career when it comes to progression, so if you’re never meeting new people you’re likely to be missing out on great opportunities. So there you have it, eight tips that I hope can inspire you and help you on your journo journey. Please ask away if you’ve got any questions at all. Thanks a lot,I have a blog,I study journalism…I aspire to write for entertainment webs and mags..what can I focus on in my blog?? Just celeb stories? ?